Welcome to my Play Garden! 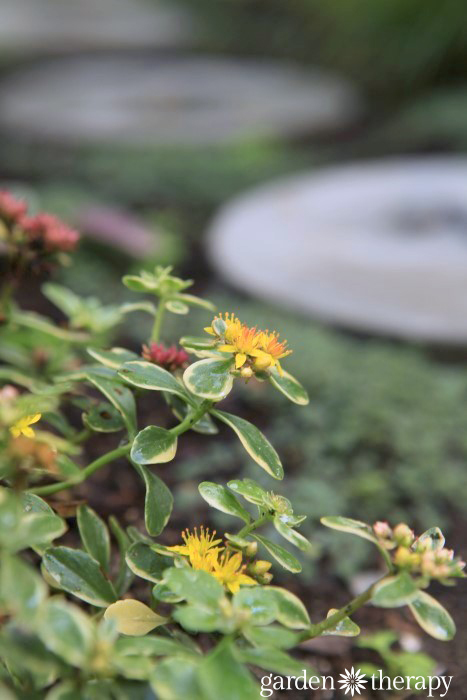 I believe that gardens should be for everyone, and this space is intended to be inviting and interesting, welcoming adults, children, and furry friends alike. 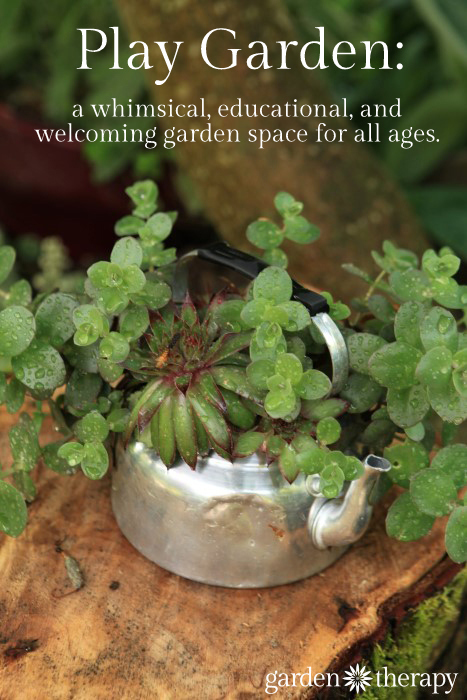 Children love gardens just as much as adults do and a long-lasting appreciation for flora and fauna comes from sharing your garden space with them. Today, I’m happy to show some photos of the backyard play space that I have been building for my family and friends to enjoy. 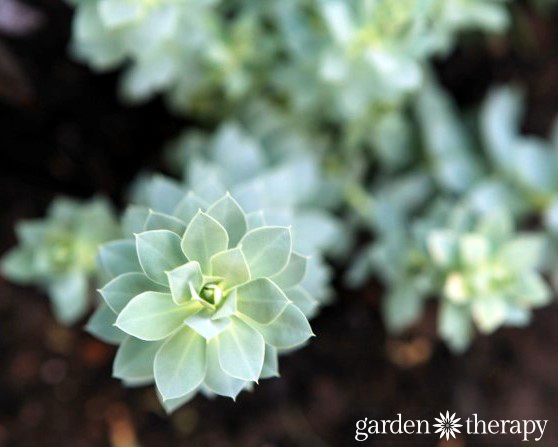 Keep in mind that growing gardens is a long-term project and this tour begins when the garden is in its infancy. The elements have been created and the plants chosen, but it will continue to grow and develop over the season and subsequent years. and the ornamental shade garden and quarry. Today the tour begins with the newly created play garden space in the backyard. When I moved into the house, all of the structure of the garden spaces and was finished and it was just the plants that needed an update. 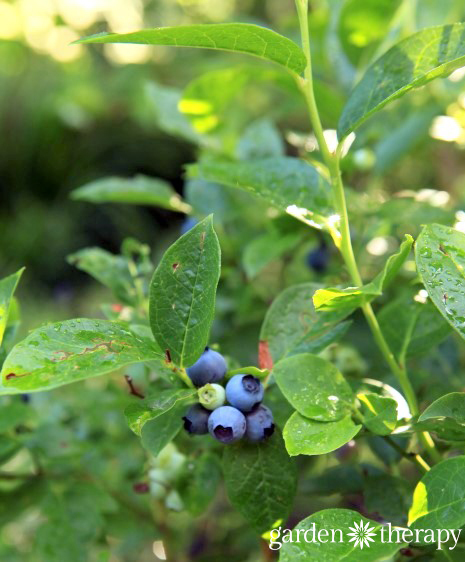 The trees were planned out well around the property to bloom in succession, bringing interest to the garden from early spring into summer. 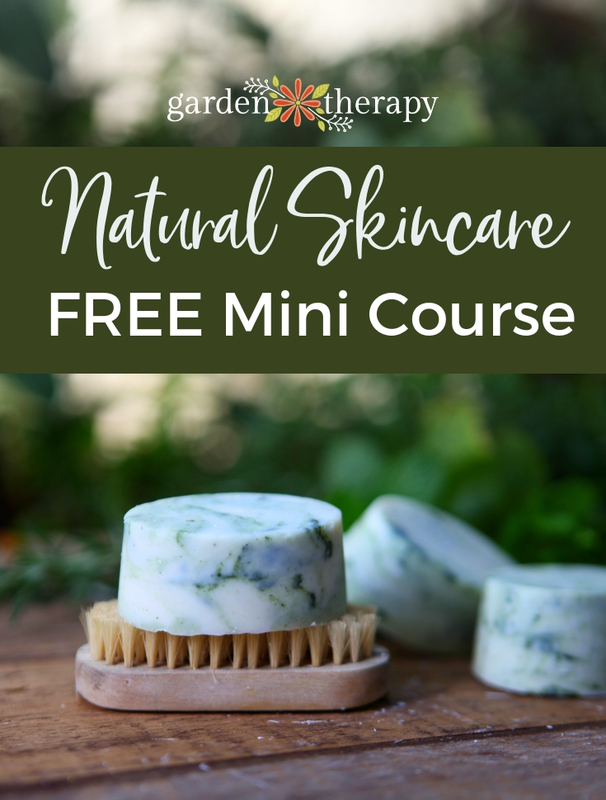 But the garden beds were full of 5-foot tall raspberries and roses and other thorny, green things that created a visual barrier as well as an unwelcoming feeling. The worst thing I encountered, however, was that the soil was dead. Not a worm or microbe to be found. 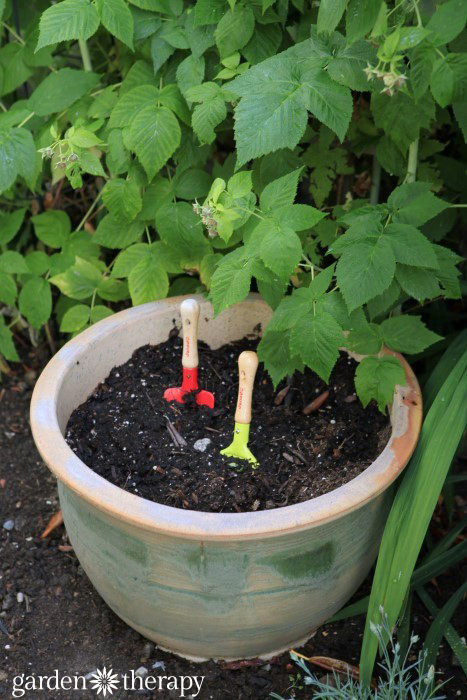 The plants had plenty of disease and struggled to thrive in this unhealthy soil. Even worse, the home renovators buried literally tons of construction material in the soil. I worked hard over the last three years to rebuild the soil (see how to do that here) and this year, finally, I was ready to plant! The back garden bed, just off the main lawn in the back yard is 5 feet wide and 20 feet long. A plain rectangle that had two large trees flanking either side and an awkward vegetable garden strip. 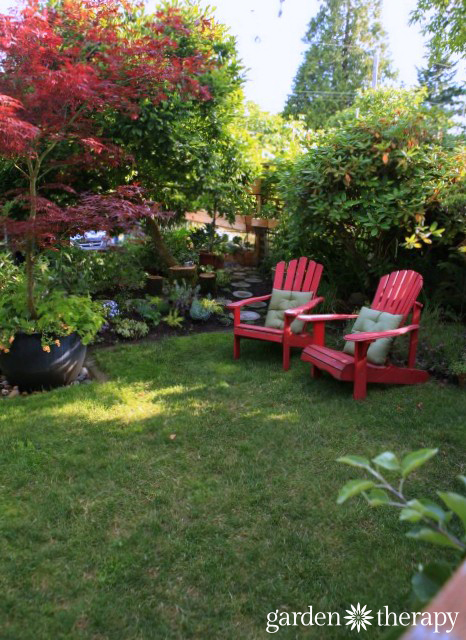 My goal for the space was to retain the current structure of the center lawn with three surrounding beds but remove the tall plantings, basal prune the trees and shrubs and remove any unhealthy or crowded plants. With the heaviness of the trees and shrubs lifted there was room for new perennials, annuals and vegetables down below. The new structure created visual room around the garden, expanding the overall living space. I wanted to integrate play structures for my toddler so that the yard would be usable but also beautiful and educational. 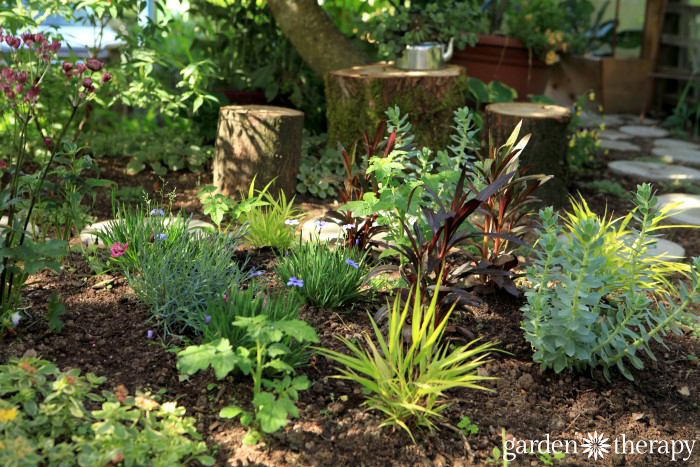 Creating elements like a table and chairs made out of found wood stumps, a hopscotch pathway through the middle of the garden, and low plantings (18″ and under) that are decorative, sensory, and occasionally edible, makes for an interactive garden space that becomes an extension of the lawn. 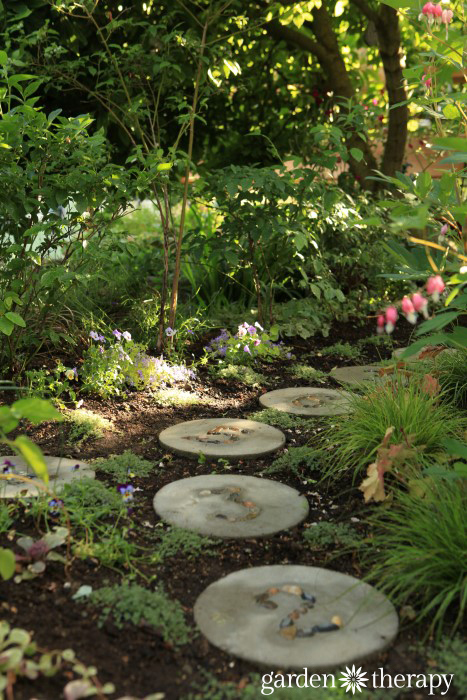 These hopscotch stepping stones were created by using this method and laid in the garden forming a path that goes by bleeding hearts, blueberries, and bunny tail grasses until it reaches the table and chairs made out of wood stumps. 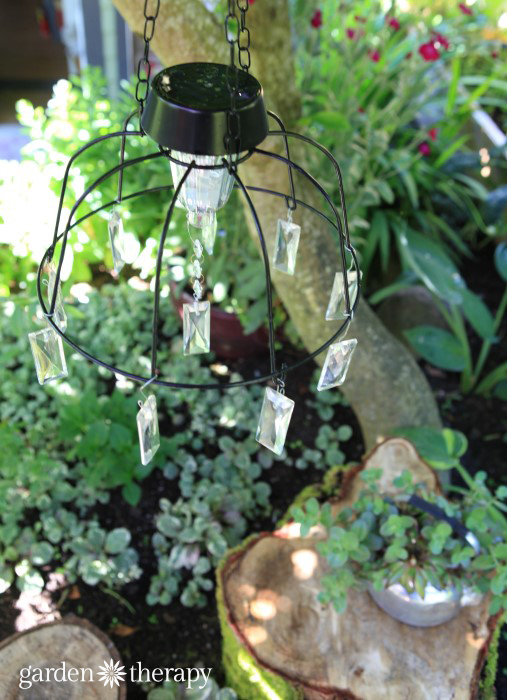 Above the table and chairs is a solar light chandelier which you can see how to make here. On the table, a tea kettle planted with succulents leads you to believe it is the perfect spot for a tea party. 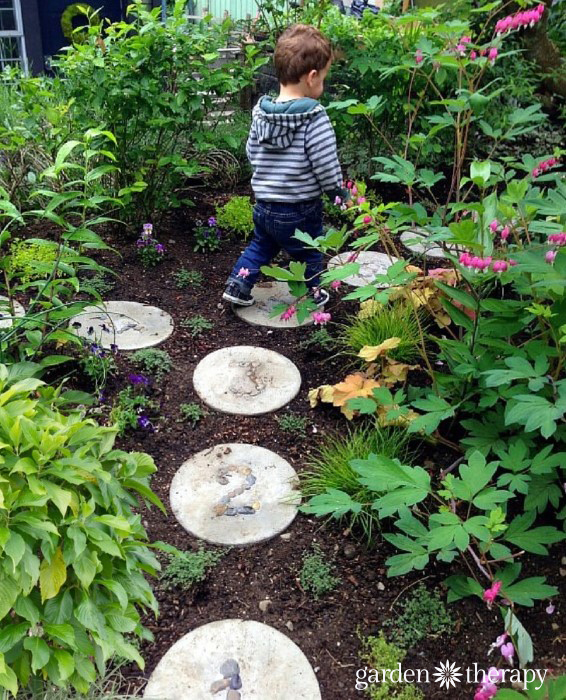 More stepping stones were created throughout the garden beyond the hopscotch stones, using prints from leaves found around the garden. 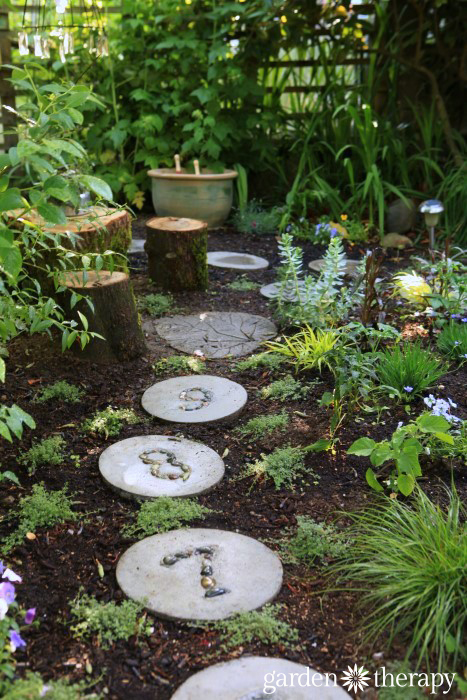 See how to make these stepping stones here. 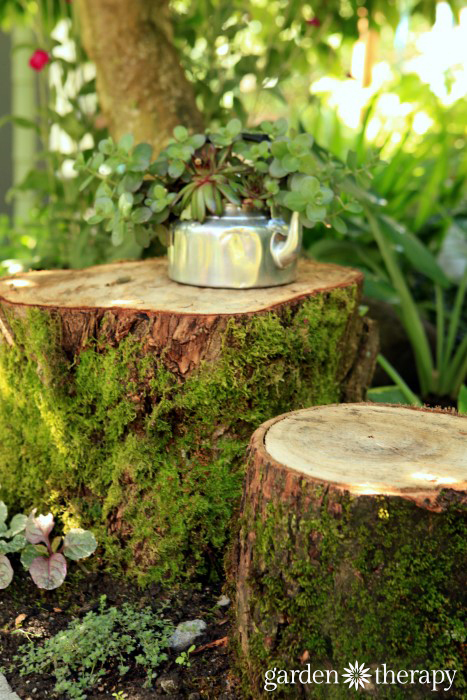 In addition, a leaf from the large rhubarb that grows at the west side of the garden was used as a mold to create the stepping stone that sits at the base of the table and chairs. 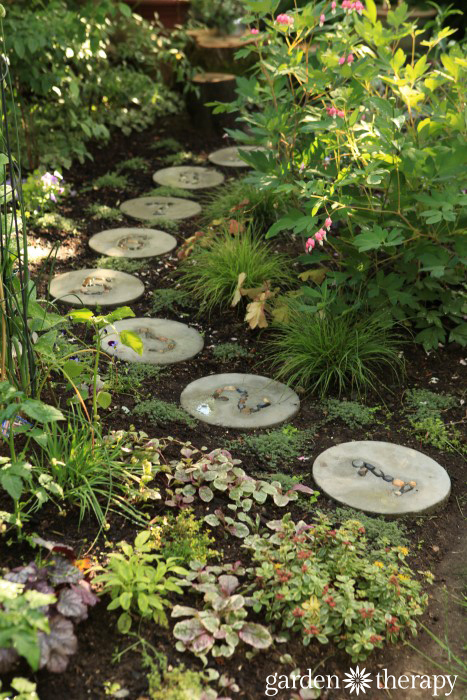 See how to make stepping stones from large leaves here. Upon exiting the play space, there is a pot for digging with a wall of golden raspberries in behind for snacking. 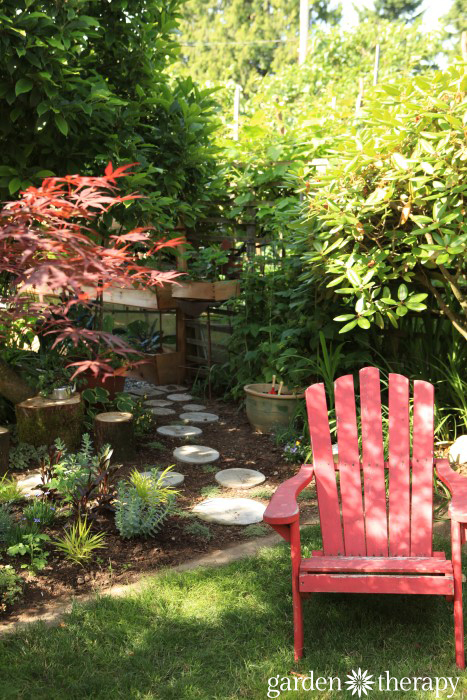 Coming out of the garden you approach two bright red Adirondack chairs, beside the Japanese maple “Bloodgood” that is planted in a large pot filled with alpine strawberry plants. I plant strawberries wherever I have a free container. 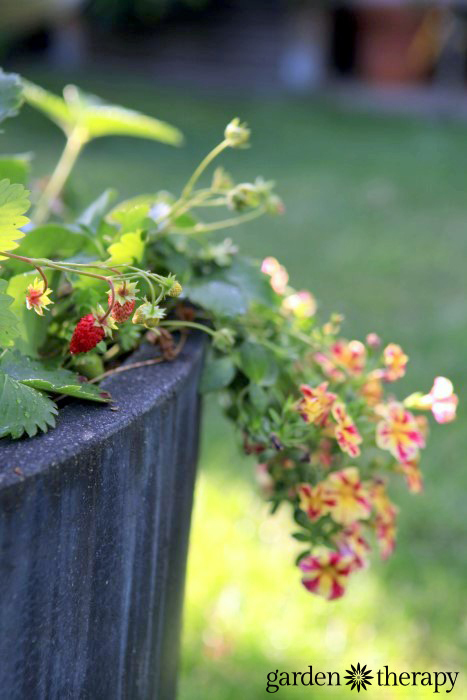 More on strawberries in containers here and here and here. My favorite place to relax is the hammock swing. 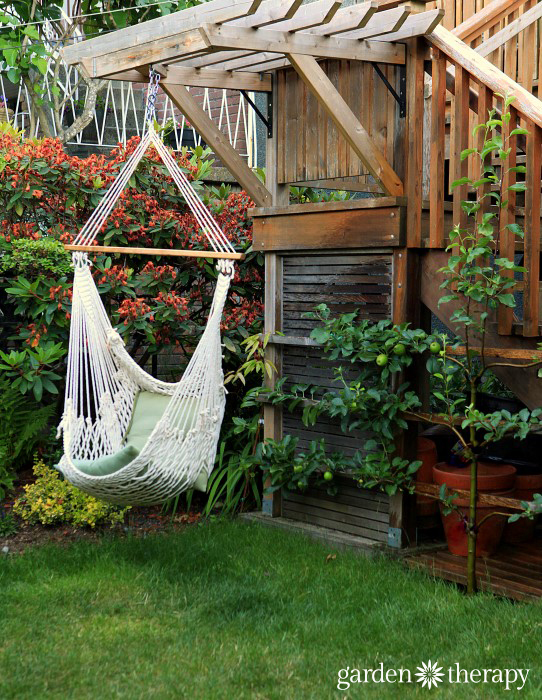 Built off the deck with an arbor structure, this hammock swing is the perfect spot to enjoy the garden. The arbor is currently growing an evergreen clematis, although it can’t be seen yet. 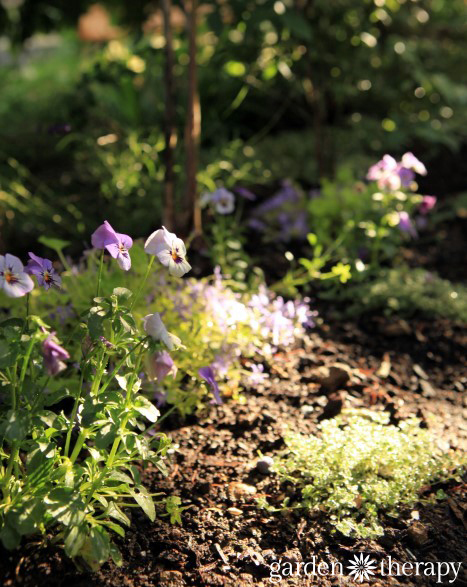 In time it will cover the arbor providing some shade and beautiful fragrance when in bloom. 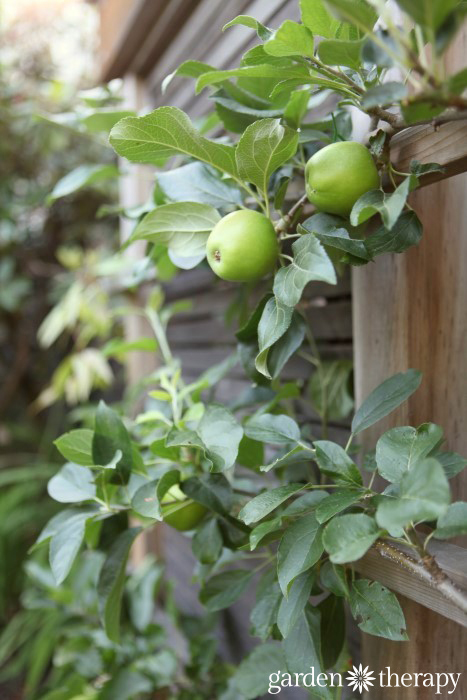 Behind the swing, growing on the side of the deck is an espaliered apple tree with five different apple varieties grafted on. The espalier tree is only two years old, yet it is producing a few apples this year! In future years, I will continue to prune and train it to produce an abundance of apples in a small space. The branches will thicken and create more buds for more apples as the years go by, but the overall height, width, and shape will remain the same. 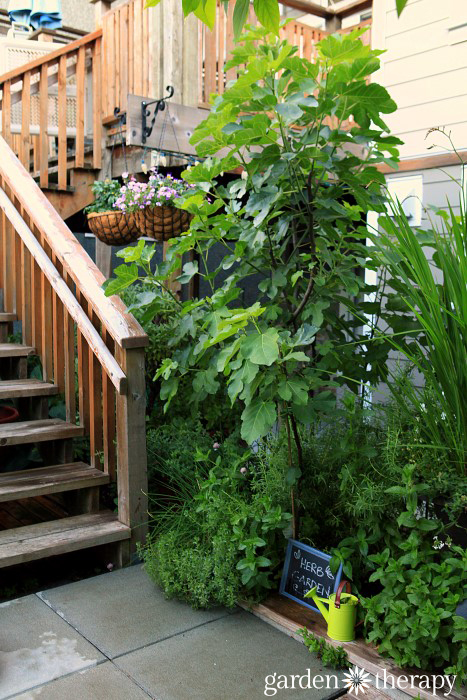 The stairs go up to the deck which overlooks the garden. 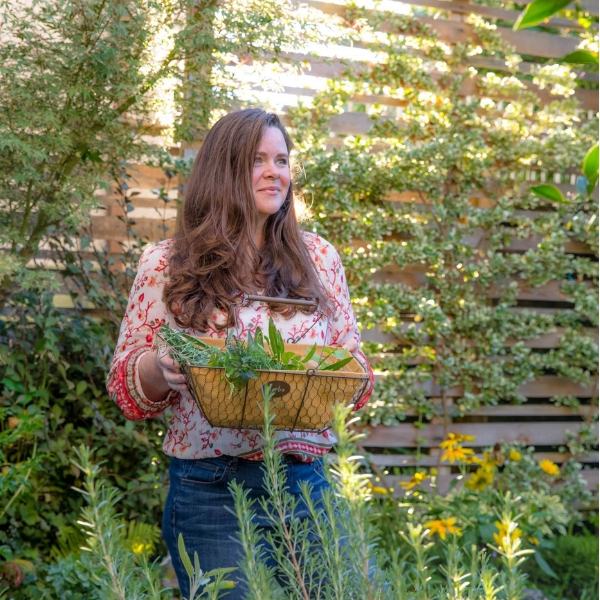 Beside the deck you’ll find the perennial herb garden which makes for easy access for zipping down from the kitchen to get some fresh herbs. The herb garden contains rosemary, sage, thyme, mint, nodding onion, chives, a large fig tree, and even a small yuzu tree I was given as a gift. 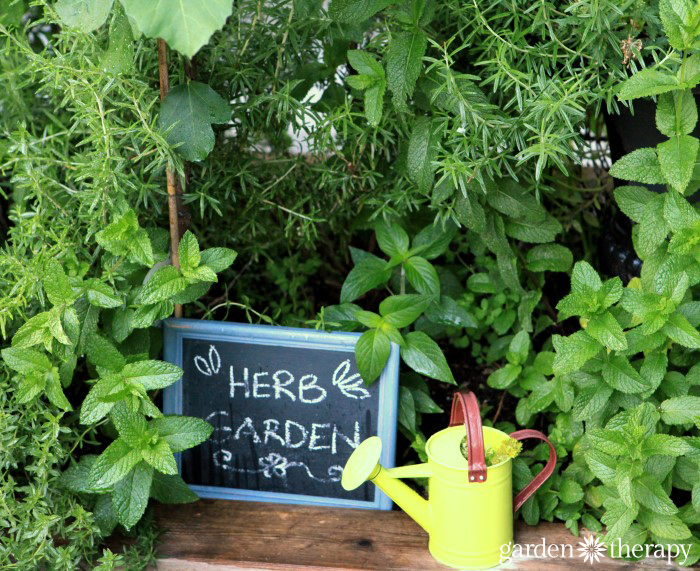 (See the perennial herb garden from my last house here). 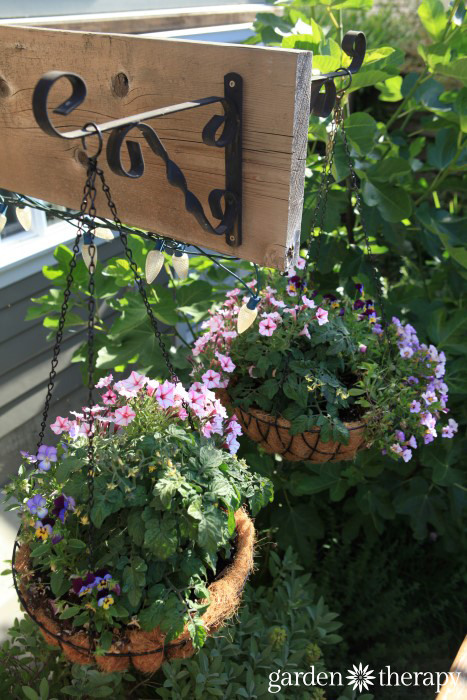 There are also a few hanging baskets with Tiny Tim Tomatoes and annuals sent to me from Proven Winners as part of their 2016 collection. All of this in a small city backyard and I haven’t even shown you HALF of the gardens! You can see many of the projects that I have done around the space in the Garden Projects Gallery.